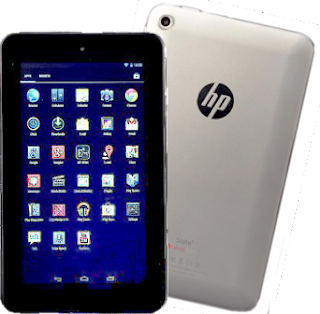 The new tablet made by HP, the HP Slate 7 a 7-Inch tablet worth affordable price. Runned and operated by Android v4.1 Jelly Bean, the tablet is fits into the latter category. Made by thick bezel and slightly heavy for a 7-Incher and doesn't come off as a cheaply made device. Has also soft-touch in back, more comfortable to hold. Features: HP put some usable apps not a bunch of annoying crapware, like HP ePrint application, that allows the user to print directly at home or on the go. Also some usual slate of stock apps as Gmail, Youtube, Google+, Hangouts etc. allows its users fast access to their email and in internet. Also its easy to view documents, games, photos and videos by the used of its High-aperture-ratio (HFFS) or Field Fringe Switching panel. Also HP Slate 7 has Beats Audio,a combo or software that makes some amazing sounds. Using headphone jack, you will appreciate the music experience when the Beats Audio is on. HP Slate 7 display resolution is 600 x 1024 pixel. Viewing angles are narrow, and also the text isn't sharp and icons aren't as crisp as they should because of its low resolution. The camera has few settings also, so it can help. For example, by switching the camera into Night Mode, at least made the objects clearly visible. HP Slate 7 is now available nationwide with a price of php 7,920.00. You can vist your nearest gadget stores or try to check some online stores and marketplaces.